Target 4.6 maintains the international focus on adult literacy that was part of the fourth EFA goal, and brings two important innovations. First, the global indicator on literacy and numeracy is formulated explicitly in terms of skills proficiency. This comes close to the view of literacy as not just a set of basic cognitive skills but also the ability to use them to contribute to societies, economies and personal change. Second, explicitly referring to numeracy calls attention to its properties. Measuring adult participation in formal and non-formal literacy programmes has proved surprisingly difficult. The Global Report on Adult Learning and Education needs to develop a standardized reporting template that at least captures adult participation in publicly provided or sponsored literacy programmes. New analysis for the GEM Report used a question once regularly included in Demographic and Health Surveys; it showed that between 2004 and 2011 only 6% of adults aged 15 to 49 had ever participated in a literacy programme in 29 low and middle income countries. The majority of illiterate adults were female and poor, yet more men and richer adults had participated. Although the SDG agenda rightly shifts attention to measures of proficiency in literacy skills, the needed measurement tools are not widely available, so reporting on youth and adult literacy based on traditional literacy rates continues. Over 2005–2014, some 758 million or 15% of adults globally lacked functional literacy skills; 63% of whom are women. Information on adult literacy and numeracy proficiency levels, which are directly assessed, is available for many high income countries. 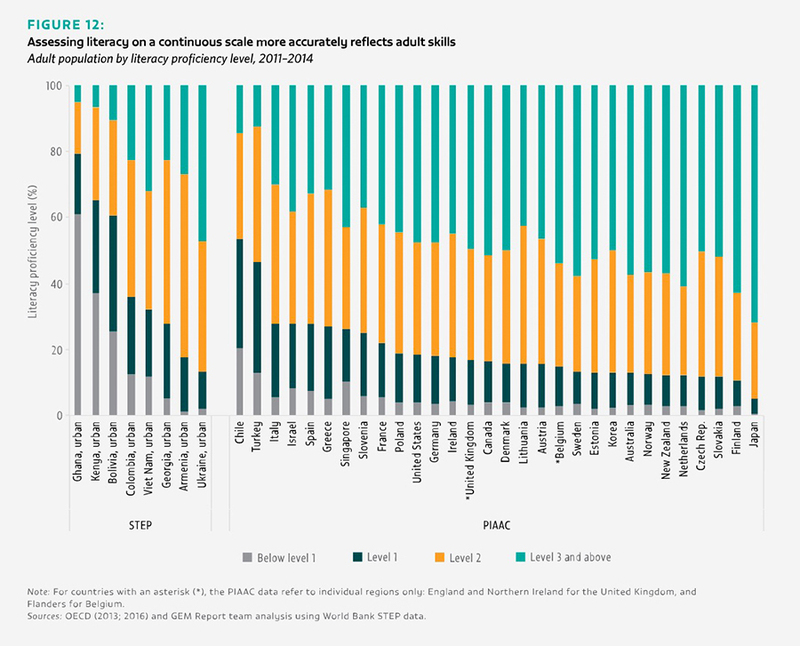 Among participants in the OECD Programme for the International Assessment of Adult Competencies (PIAAC), 15% failed to reach a basic literacy proficiency standard, which involved drawing low-level inferences from texts; the rates ranged from less than 5% in Japan to almost 28% in Italy. International collaboration is needed to facilitate comparative literacy and numeracy assessments. To provide useful monitoring data by 2030, a successful approach has to balance countries’ ability to proceed on their own against the need for assessments to meet global standards.